All dancing in this summer is in Seeley Hall as depicted in the photos. In the autumn and winter when Seeley Hall is not available because Trinity College needs it we are moved over to Cartwright Hall in St. Hilda's College (link is to map) on Devonshire. Parking is available in nearby lots across the street, on the street on Devonshire and in the Trinity parking lot off Devonshire as well as the new lot beside the Goldring Centre also on Devonshire. There are two subway stops nearby: St. George and Museum. Dancing is a cooperative effort. Volunteers bring juice and treats for the break, with costs paid for from money collected. We normally dance in Seeley Hall (as seen in the two photos) on the second floor of Trinity College, 6 Hoskin Avenue, on the University of Toronto campus. To the left and below is a Google map showing the locations of Trinity College and St. Hilda's College. Seeley Hall is in Trinity, up the centre stairs to the second floor on your left. Cartwright Hall is straight across from St. Hilda's main entrance. You don't need to be Scottish. You don't need a partner. Everyone is welcome. Parking is available off Devonshire behind Trinity for $6 (coins or credit card required for ticket dispenser) or on the street. The nearest subway stop is Museum on the Yonge/University line, St. George is the nearest stop on the Bloor/Danforth line. 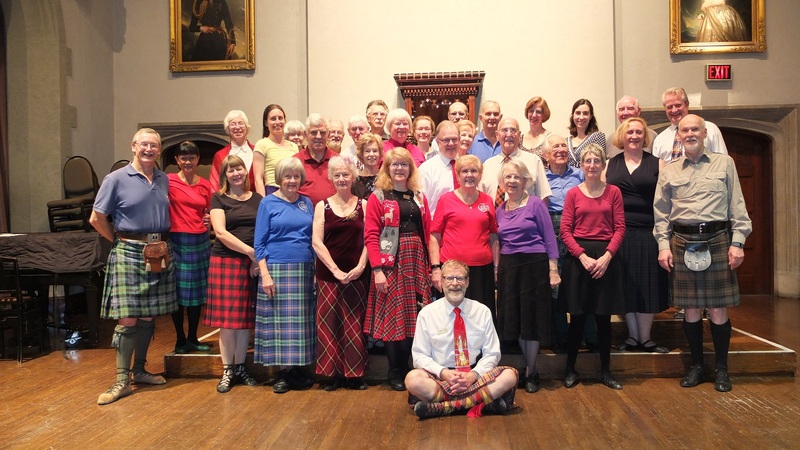 The cost is $3.00 for members of the Trinity Scottish Country Dance Group, $5.00 for non-members. The annual membership fee is $20 and is good for one calendar year from the date of purchase. Scottish Country Dancing is a modern form of the `country dancing' popular in England and Scotland in the 18th century. It involves groups of six to ten people -- a `set' -- dancing to the driving strains of reels, jigs and strathspeys played on the fiddle, accordion, flute, piano, drums, etc. 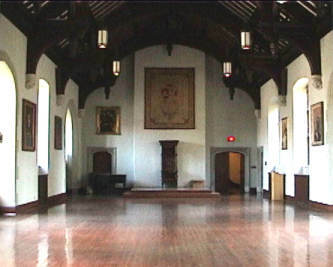 At Trinity, dances are briefed and walked through slowly before the music starts. To find out more see this page on the Strathspey Server. To see Christmas photos from years past click here. 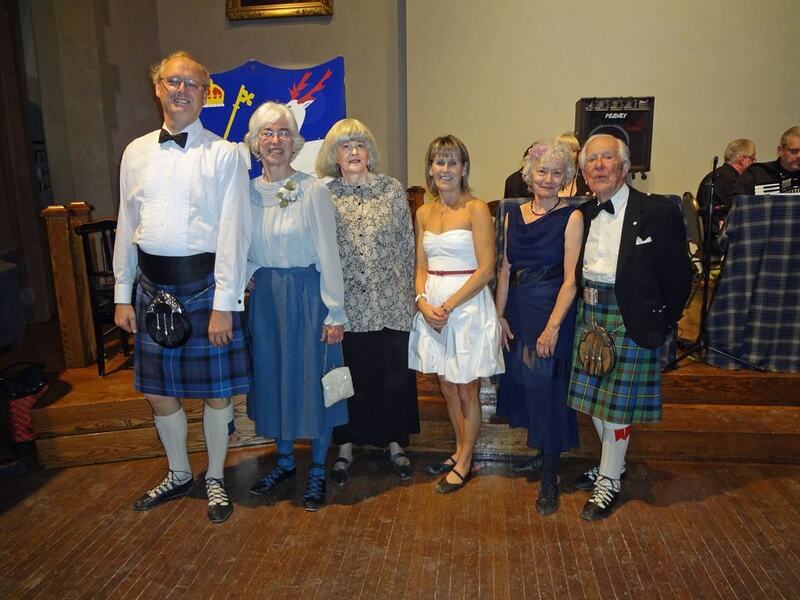 What do all these dancers attending the special Trinity Scottish Country Dance Group's 40th Anniversary Assembly on November 23, 2013 have in common? Click on the photo to find out and see more photos and the program of the special Trinity Assembly. If you wish send me an email requesting that your name be added to our email list. I send out occasional notices of change of venue and the beginning and end of sessions. For information on Toronto events visit the R.S.C.D.S Toronto web site, where you can also find information on their excellent and easily accessible classes at all levels. Please note that, although we have danced at Trinity since 1973 we are not formally affiliated with the College.